Memory set to 4.000 GiB by Python script. ValidationError: SAPT requires requires "reference rhf". -please resolve my error in calculation. What version of Psi4 are you using? Your traceback leads me to suspect the version you are using is rather old. Depending on how old it is, open-shell SAPT0 may not exist in the code. The Psi4 which I am using is just downloaded and installed last weak from this site last 10 days back. Just as I thought, you need to update your version of Psi. Upgrade to Psi 1.3, and you can do open-shell SAPT0. Get the latest version here. Let me know if that works! Where did you find a link to that version of Psi? Something that old shouldn’t be on this site. I don’t remember the version that I have downloaded but I am sure it was from this site psicode.org. so, I’ll download the Psi4 1.3 version from the your link or the site. I downloaded the Psi 1.3 from the site, please tell me how will I upgrade my 1.0 version with 1.3. Well, how did you install it? 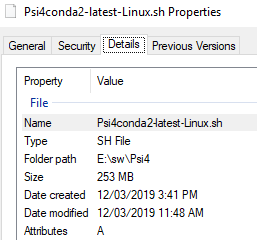 Once the path is set up correctly, typing psi4 on the command line should just use Psi4 1.3. Lori explained it here. You can ignore that message, or use the changes she suggested if that warning bothers you enough. Marking the topic closed, then.